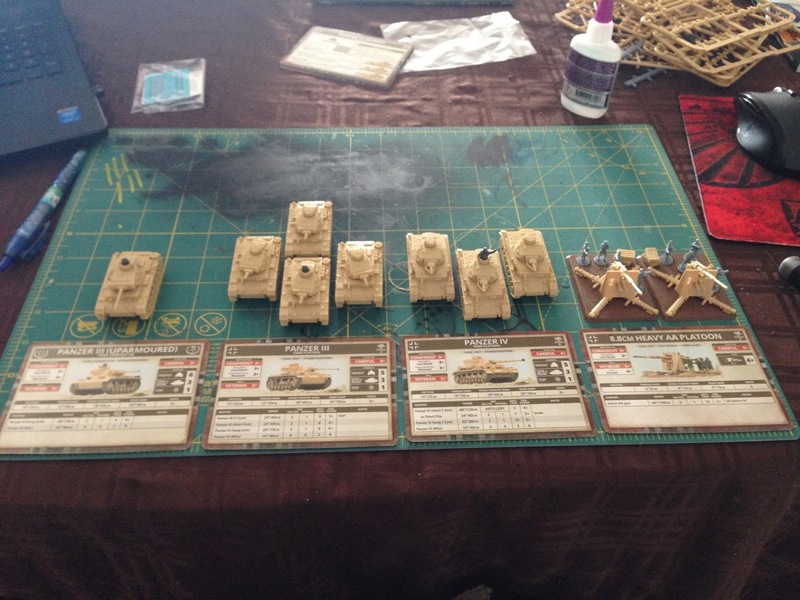 My buddy talked me into giving a demo game of Flames of War a shot. It's a pretty solid game. I've always steered clear of historical games because they always seemed ridiculously complicated and unfriendly to anyone not willing to spend lots of research time and effort making everything historically accurate. Also, there's the issue of playing as REAL bad guys. I know it's just a game, but it feels a little odd. My plan is to just play and enjoy the game as the tactical exercise that it is. 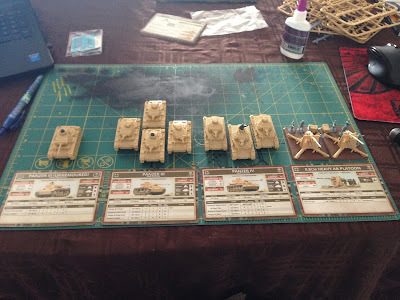 BUT... my experience is that the new 4th edition of Flames of War is pretty straightforward. The people I've met who play seem like completely normal people. None of them seem too worried about historical accuracy. It's more about just having fun. Plus, the historical paint schemes are stupid easy to replicate. In fact, the sandy colored plastic the tanks come in is pretty close to what you'd have seen in desert warfare. 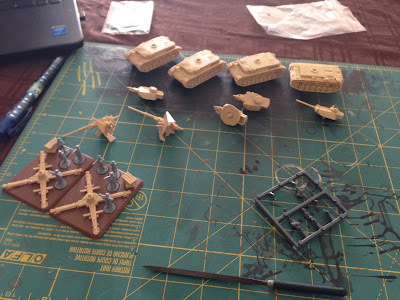 I picked up a German starter army. I just like the tanks more. From what I understand, the Germans had better tank tech in the middle part of World War II. I'll need to pick up one more box next week when it releases, but other than that, the starter has almost a full, standard 100 point list. The core box came with five of the Panzer III tanks, three of the Panzer IV tanks and 2 of the 8.8cm AA Guns. 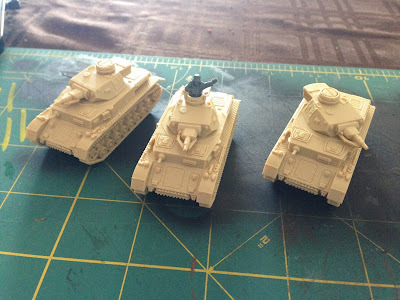 I set one of the Panzer IIIs up as an uparmoured command tank. 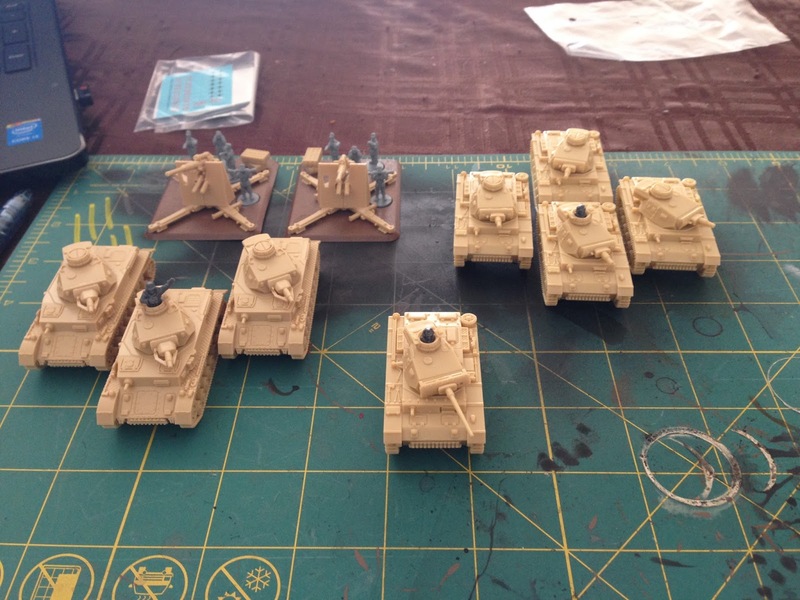 The other four form a required Panzer III Platoon. The three Panzer IVs form the second required Platoon. From a Warhammer 40k perspective, there are three "Detachments" you can pick from. 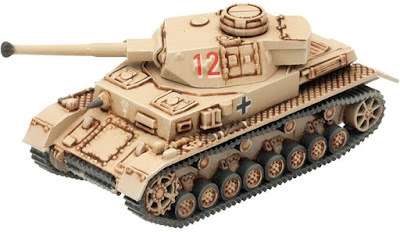 I chose the Panzer III Company. It's more or less 1x HQ, 2x Troops and a bunch of optional choices. 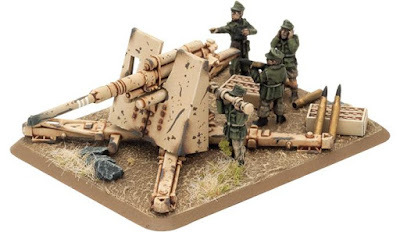 The 8.8cm AA Guns count as an optional choice. The last box I need is a Tiger Platoon. 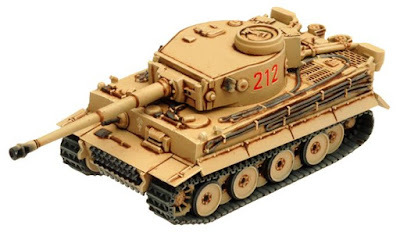 The Tiger is a more heavily armored tank with a much stronger main gun. In game, this one take takes up 29 points. It's a major threat. The models are surprisingly detailed, considering that they're about the size of matchbox cars. They're pretty easy to assemble. I built the whole box while watching Doctor Strange... so, about 2 hours or so. I used a combination of plastic and super glue to make things stick. 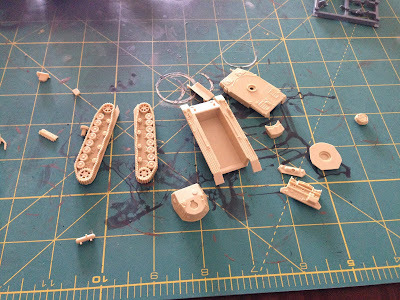 The super glue came in handy for the dudes on the AA Gun bases. Also, keeping the AA gun barrels pointed up. Plastic glue is better for me most of the time, but sometimes the quick setting of super glue is great. Here are a couple of shots of my work in progress today. All the bits and pieces that make up a Panzer IV. 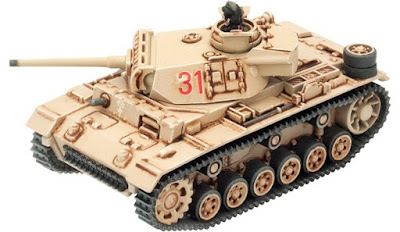 The Tanks don't have bases. The AA Guns do. So many treads. 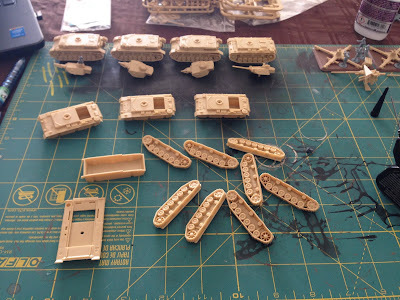 The Panzer IIIs are coming along. Everything is assembled. Apologies for the spotty photos. This is the army so far, broken down into units/squads and sitting next to their unit cards. I'm missing a fifth unit that will release next week.